Day 1: Arrive into Kuala Lumpur and board a flight to Kuching in the state of Sarawak, Malaysian Borneo. Day 2: Take a city tour of the charming city of Kuching. Once the capital of the White Rajahs of Sarawak, the city has some intriguing sights – touring could include the City Mosque, Chinatown, Tua Pek Kong Chinese Temple and Sarawak Museum. Day 3: Spend today in the incredible Bako National Park. The park can be explored by boat where you can spot a wealth of wildlife such as proboscis monkeys, macaques and plenty of birds. The coastal scenery here is spectacular. Day 4: Travel from Kuching to Sandakan, which is in the state of Sabah. 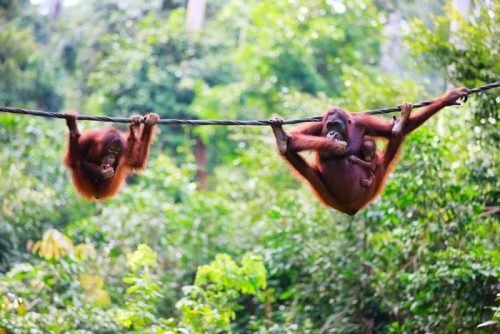 Day 5: Transfer to Sepilok Orangutan Rehabilitation Centre and spend the morning learning about the work it does and observing the orangutans that currently call it home. Nearby is the Bornean Sun Bear Conservation Centre – also very much worth a visit. Later, cruise along the Kinabatangan River which passes through virgin tracts of rainforest full of nature. Day 6: Take a second cruise on the Kinabatangan, this time reaching Kelenanap Oxbow Lake, a haven for birds and other wildlife. Take a jungle trek to get a feel for the Bornean wilderness. An evening boat cruise reveals a whole new world of wildlife. Day 7: This morning, visit the Gomantong Cave. Here they sustainably harvest the nests of swifts which are eaten in a soup as a local delicacy. You’ll also head deeper into the caverns at Semut Hitam cave. Fly from Sandakan to Kota Kinabalu. Day 8: Visit the Mari Mari Cultural Village where you can experience the culture of the different ethnic minorities that call Sabah home. You’ll see how to make a blowpipe, how to start a fire with bamboo and traditional tattooing. Day 9: Fly from Kota Kinabalu to Kuala Lumpur and spend the day soaking up the atmosphere of this vibrant, cosmopolitan city. Days 10 – 13: Free time in Kuala Lumpur for your own explorations. Day 14: Fly from Kuala Lumpur to Langkawi. Day 15: Take a boat safari through Langkawi Geopark, which boasts a unique ecosystem that is home to monkeys, kingfishers, eagles and much more. Stop off at a sheltered beach for a refreshing dip. Day 16: Spend the day exploring some of Langkawi’s other sights – the tomb of Mahsuri, Air Hangat Village and its hot springs, and local cottage industries. Days 17- 21: Days at leisure to enjoy Langkawi’s beautiful beaches – all out relaxation starts now. Day 22: Fly home from Langkawi, connecting in Kuala Lumpur. We think you’ll agree that that is a truly awesome itinerary. If you feel inspired to do the same, something similar or just like the idea of a big adventure, give the team a call and start planning!